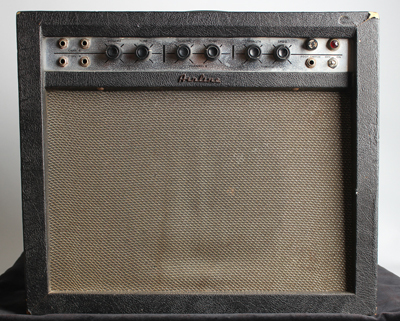 Airline 62-9013A Model Amplifier (1964), made in Chicago, serial # 1112, black tolex covering finish. The Airline brand name was applied to a line of musical instrument related products distributed through the Montgomery Ward’s catalog throughout the 1960s. The amplifier line consisted of rebranded amps made by Valco and Danelectro. The Airline 62-9013a was manufactured by Danelectro and was almost identical to the Silvertone 1472/1482 except for a horizontal control layout and different screen printing. The 62-9103a is a very similar setup to the brown era Fender Deluxe amp with two 6V6 power tubes making about 12 watts through a 12? Jensen speaker. The tremolo on the Airline/Silvertone amps is more of a dramatic thumpy tone compared to the Fender’s smoother wobble. This Airline is in great shape and ready for the studio. It has an updated 3 prong power cord, but is otherwise all original. This Airline amp has that classic tube amp thick clean and smooth crunch tone when driven. The original Jensen C12R sounds strong. Height is 17 in. (43.2 cm. ), 20 in. (50.8 cm.) width, and 8 in. (20.3 cm.) deep. All original except for an updated 3 prong cord, with some general wear and tear, no major repair. There are a couple minor chips to the tolex cover on the front corners and other areas. The grill cloth has some discoloration but is in tact with no holes or fraying. The control panel is bright and clear with very minor corosion. All decals are still legible. Very Good + Condition.